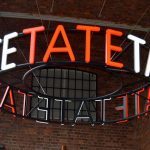 After our exploration of Tate Liverpool on Sunday morning we took a wander around a very cold and drizzly Albert Dock. 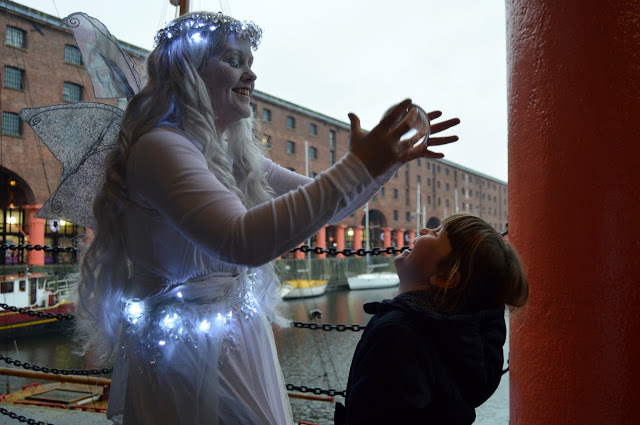 Throughout December Albert Dock have a range of festive activities going on to get us into the seasonal mood. 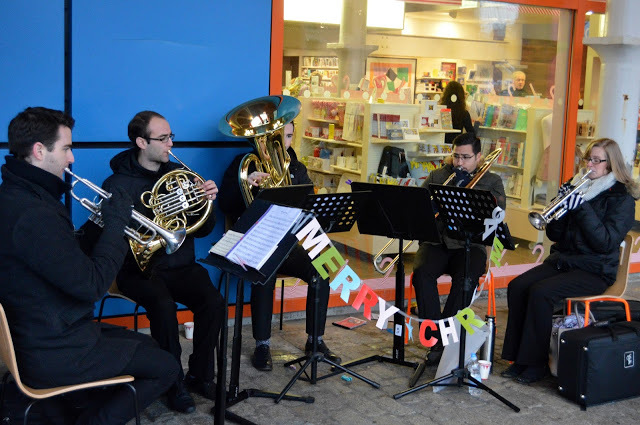 Today we found a brass quintet playing well known Christmas carols, which I loved – you can’t fail to feel festive with a brass band providing the soundtrack to your adventures can you? 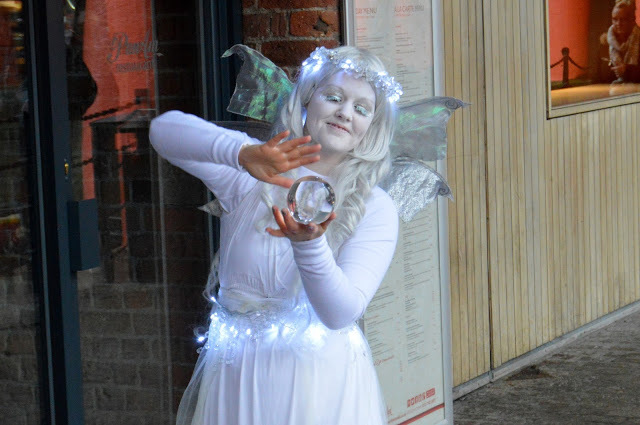 And we also came across the magical Winter Fairy who Chloe was utterly entranced by . . .
We had been invited to enjoy lunch at What’s Cooking? 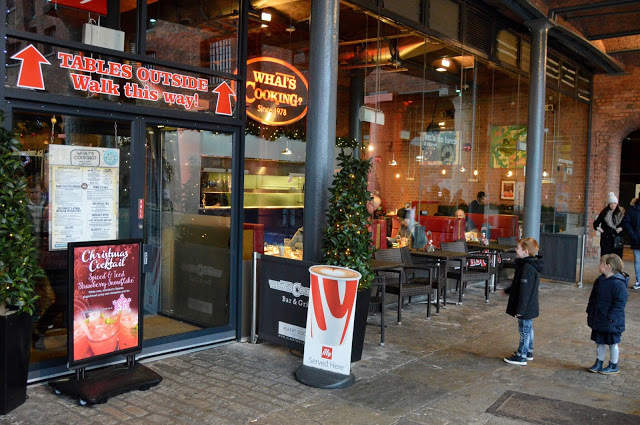 on the Albert Dock and we were more than ready to have a sit down and something to eat. 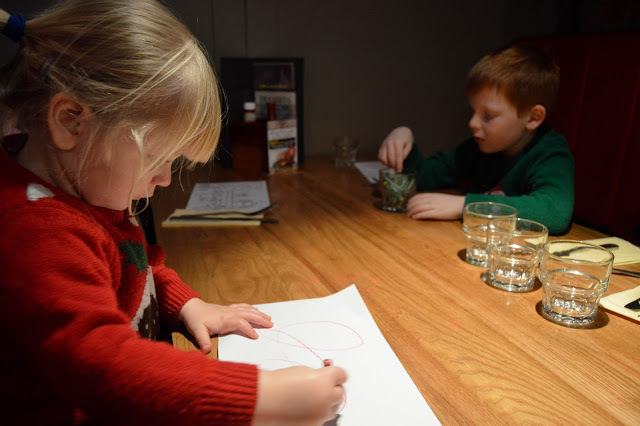 We were shown to an enormous booth and the children were given colouring sheets and crayons before our drinks orders were taken. 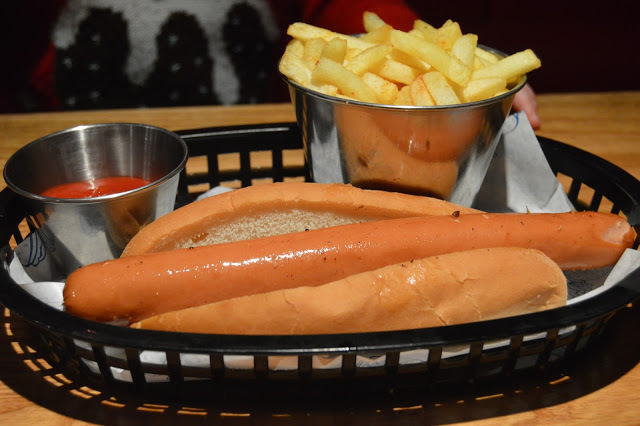 The children’s menu (for under 12s) is fairly standard – burger, fish fingers etc. 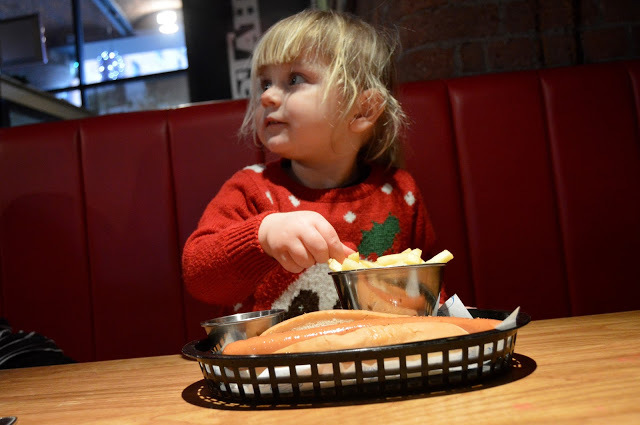 Ben went for his current favourite of a cheese burger, Chloe surprised us by choosing a hot dog and Amy wanted “pink and red” – goodness knows what this is but she’s tried to order it twice this weekend! We decided we’d get her a hot dog instead. 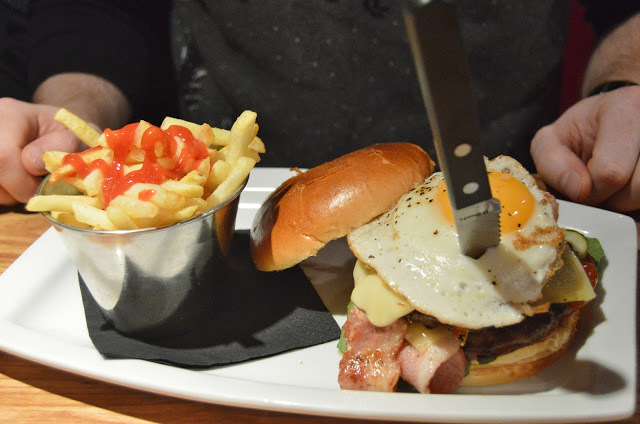 Dave and I went straight for the handcrafted burgers – the Bacon Stack for Dave (a double burger with smoked bacon, Monterey Jack cheese and a fried egg!) 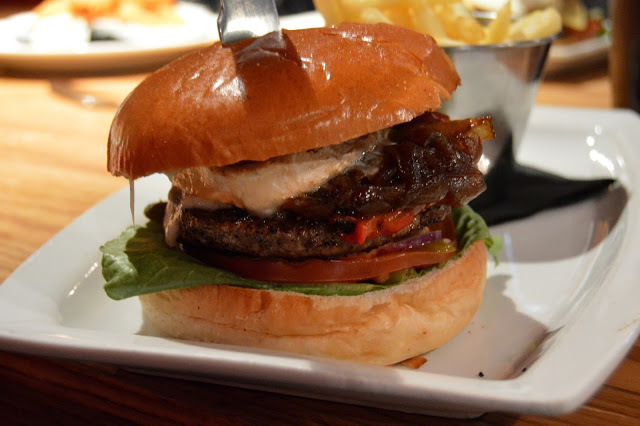 and I didn’t get any further down the menu once I spotted the Billy-Boy Burger – as someone who loves goats cheese this combination of a burger with goats cheese, roasted red pepper and apricot & ginger sauce with caramelised onion was a no brainer! We also ordered a side of onion rings. 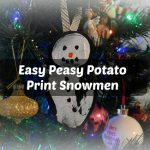 I couldn’t tell you how long it took for our order to arrive but it was a perfectly reasonable time – we certainly didn’t feel we were waiting around for it. I think one of the biggest compliments to the food is that our table fell almost silent as we all tucked in. Both Ben and Chloe completely cleared their plates – which is not all that common when we eat out. 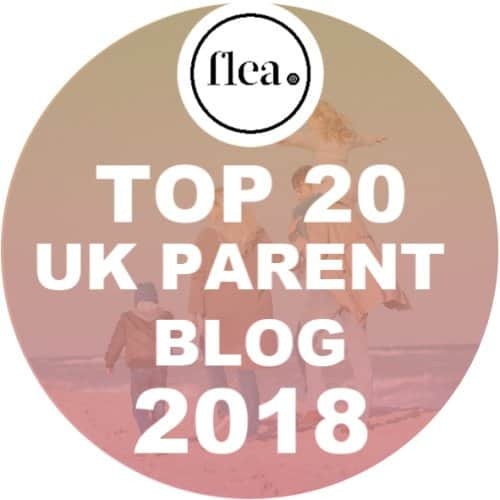 It can be very hit and miss as to how much all three of them eat and we often buy two meals to share between the three of them but this time they made short work of their lunch! In fact Ben had actually finished his lunch before Daddy! Both of our handcrafted burgers were absolutely delicious and could only be described as “knife and fork jobs”. Of course it would have been rude to decline the opportunity for dessert . . . again the children’s menu was fairly basic with ice cream or chocolate fudge cake – but really what more could kids want than that? Ben and Amy went for chocolate fudge cake and Chlo chose to have vanilla and strawberry ice cream. Again all three kids pretty much cleared their plates! 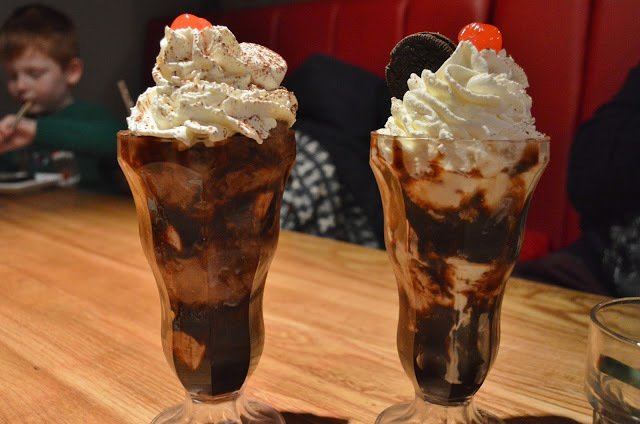 Dave and I were blindsided by the Ben and Jerry’s sundaes – ordering a Cookie Dough sundae and a Phish Food sundae – with the intention of sharing them but I must admit that once I got stuck into the Phish food I just couldn’t give it up again, sorry Dave! We were all absolutely stuffed and fully satisfied by our meal at What’s Cooking? and I think the fact that Ben asked “Mum, can we come here for birthdays now?” says it all really! We would absolutely return to What’s Cooking? like a shot! 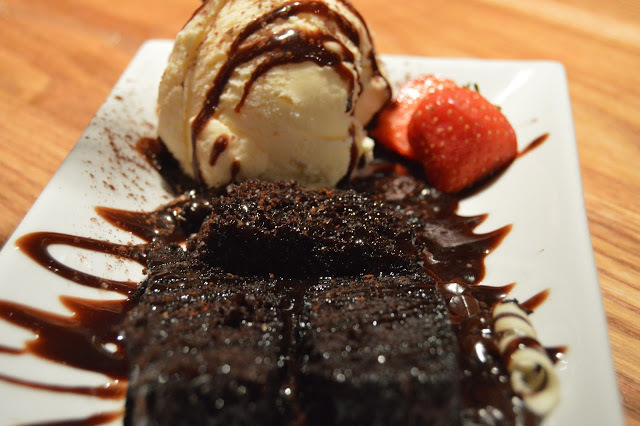 That chocolate fudge cake looks delicious! I love Liverpool but I've not been since before the babies arrived! What's Cooking sounds like a definite restaurant to add to the list! Oh goodness, I didn't know What's Cooking? was still there! 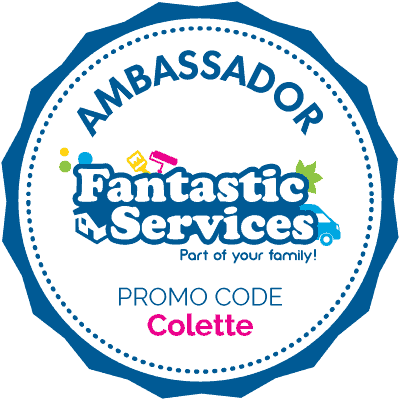 I used to have a badge on my primary school bag from there back in the late 80s or early 90s!! That shows my age, and what a hit it was then! Funnily enough my best friend said that it was somewhere she used to eat as a kid too! What a great endorsement by your boy.the size of the food portions looks amazing, very generous. 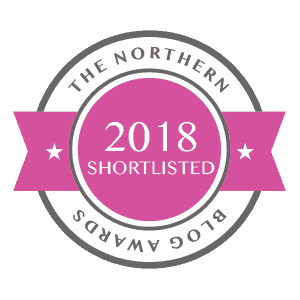 This looks fab and so much fun! Thanks for hosting #triedtested and happy christmas! 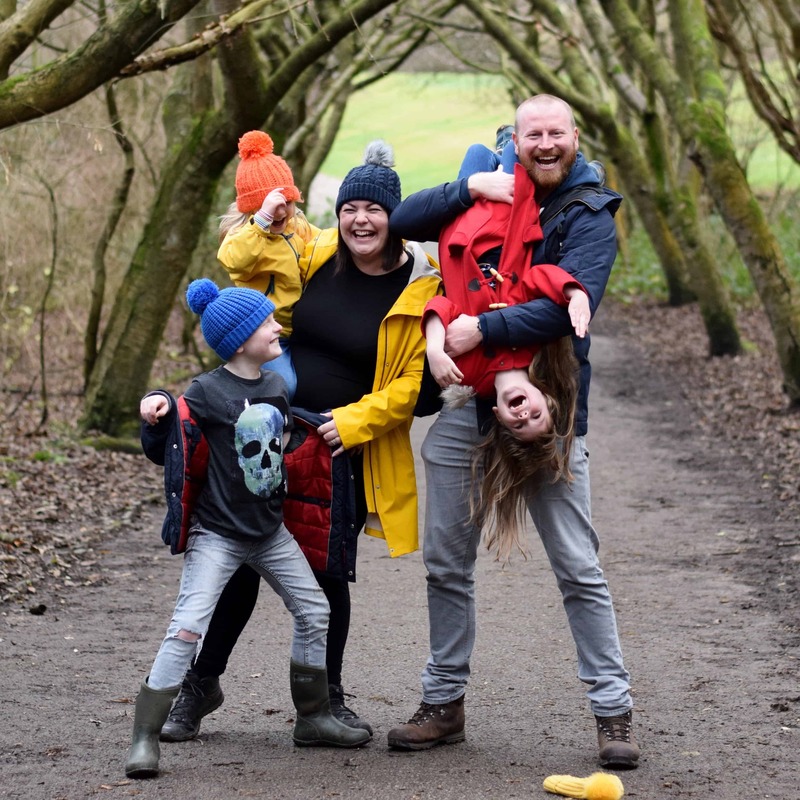 It sounds like you had a great day out, and the kids were well catered for!